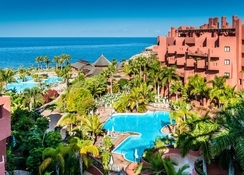 Sheraton La Caleta Resort & Spa is the first of its kind resort situated in South Tenerife, where you enjoy a beautiful shoreline, golden sandy beaches and exotic trees. As the name of this resort suggests, this is the best place to relax and recharge at the hands of expert masseurs. The six restaurants and bars at the resort will let you explore various cuisines including Japanese, Spanish, Mediterranean and many other as well. The bars also serve delicious cocktails as well as other beverages coupled with live music and of course the magnificent view of the Atlantic to make your vacation exciting and memorable. The outdoor swimming pool and not to forget the spa are where you can relax and keep your stress at bay. After all these exciting activities, you’ll need accommodation that lets you rest and get charged up for the next day! The Sheraton doesn’t disappoint here! With spacious rooms featuring all modern amenities, you’ll surely be well rested and charged up for the next day! 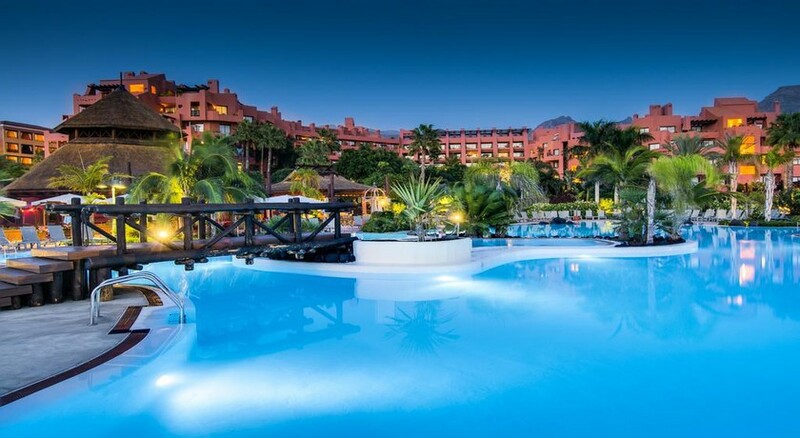 The Sheraton La Caleta Resort & Spa enjoys a scenic location in South Tenerife, close to several local attractions! 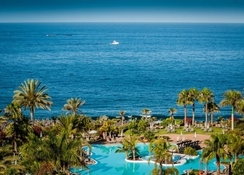 Head over to the El Duque Beach, a mere kilometre away, to bask in the balmy Canarian sun. The Tenerife South Airport is only 22.3km from the resort, making it convenient for the guests to board their flights on time. The rooms at Sheraton La Caleta Resort & Spa are spectacular, as they not only comprise elegantly styled furniture, but also offer breath-taking views of the Atlantic Ocean. Whether you are a solo traveller, couple, family or with a group of friends, you will definitely find a room that suits your requirements. The rooms are divided into the following categories: Superior Rooms, Premium Rooms, Club Floor Rooms, Deluxe Suites, Premium Suites, Club Terrace Suites (with a private Jacuzzi) and La Caleta Suite that comprises a large terrace that overlooks the Atlantic Ocean. Each room comes with upgraded amenities, including make-up shaving mirror, Hairdryer, Spacious Bathroom, Cribs (Upon Request), Sheraton Signature Sleep Experience, Rollaway Beds, Hypoallergenic Pillows, Refrigerator Available (Charge), Coffee Maker, 24-Hour Room Service, Mini Bar, Satellite Channels, 40" LCD Television, Alarm Clock, Dual-Line Telephone, Sheraton Dog Bed Available, Iron, Ironing Board, Electronic Safe, Air-Conditioned Room, Turn Down Service, 100% Non-Smoking Guest Rooms, Ocean View Room, Accessible Room, Connecting Rooms Available, Private Terrace, Club Level Room Available and Wi-Fi (extra charges). At Sheraton La Caleta Resort & Spa, the food and drink is true to its roots. Here you can savour your taste buds with the best of Spanish gastronomy, setting your mood for an immaculate night. 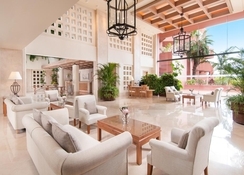 The restaurants and bars include Kamakura Japanese Restaurant, La Venta Restaurant, Vivace Pool Restaurant, El Parador Restaurant and Coral Pool Bar. There are plenty of sports, leisure and entertainment options to keep you engaged throughout the day. Some of the sports facilities in the hotel include outdoor swimming pools for adults and children, outdoor tennis court, steam bath room, Sheraton club lounge, 9-hole miniature golf course. Or just laze down in the spa, where you can avail innumerable massages and beauty treatments from head to toe. Explore the island at your own pace by leveraging the car rental service provided by the hotel. When the adults are busy with sports or a massage, the kids can have unlimited fun in the Guanchito kids club under the supervision of the hotel’s staff members. Other than this, there is an exclusive sea front setting for conducting business meetings or social celebrations like receptions, birthdays or anniversary celebrations. Amazing hotel and staff, fantastic location. We had an incredible stay and would definitely return. Truly recommend this five star resort to those who like luxury, excellent service and amenities and somewhere nestled peacefully in tranquility but is a short stroll from restaurants and bars.